Our programme manager for Liberia reflects on his first two years working in the country. As I arrive back in Tubmanburg, Liberia after a Christmas break spent in Northumberland, I know exactly what my friends and colleagues are going to say: “John, you’re so fat”, “look at your big tummy” etc. Even the deaf students in the school within the Mary’s Meals compound – the Oscar Romero School for the Deaf – are making the sign for “you’re fat”. If I was in Northumberland, it would be a cause of some embarrassment but, after living here in Liberia for the last two years, I am well aware that calling someone fat is quite the compliment! It’s the locals’ way of saying you look fit and healthy. 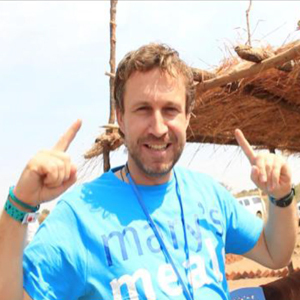 It’s been an interesting two years for me here in West Africa, as part of the team which works to provide a school meal in around 450 schools to 135,000 students every school day. One of the biggest challenges we’ve faced has been the Ebola emergency that resulted in schools being closed for an extended period between June 2014 and March 2015. With fear gripping the country, lives were lost and children orphaned, but incredibly things have rapidly returned to a semblance of normality. It makes me think of the many differences between the people here in Liberia and my friends and family back home. The 14-year civil war that ravaged the country between 1989 and 2003 continues to play its part in the national psyche, with the majority of the population having been displaced and all affected by the conflict. Despite the differences in climate, culture and economy, what really stands out is that Liberians have the same hopes and aspirations as most people. They want to provide for their children so they can receive an education and live a happy and fulfilling life free from the conflict and violence that has blighted many of the adult generation. Mary’s Meals does not have a magic wand to wave and provide a solution to all of the challenges that Liberians face but, by providing one meal a day in a place of education, we hope to encourage more children to attend school and stay for the duration of classes – so that they may learn from the lessons of the past and, through education, look forward to a bright future.